Quilting was not a tradition passed on in our family. I have never quilted in my life. Wait . . . I take that back . . . I put a few crooked stitches in a quilt that was being made for William’s cousins when they got married. Maybe those few stitches gave me my first interest in the tradition of quilting. But, that was probably 15 years ago. 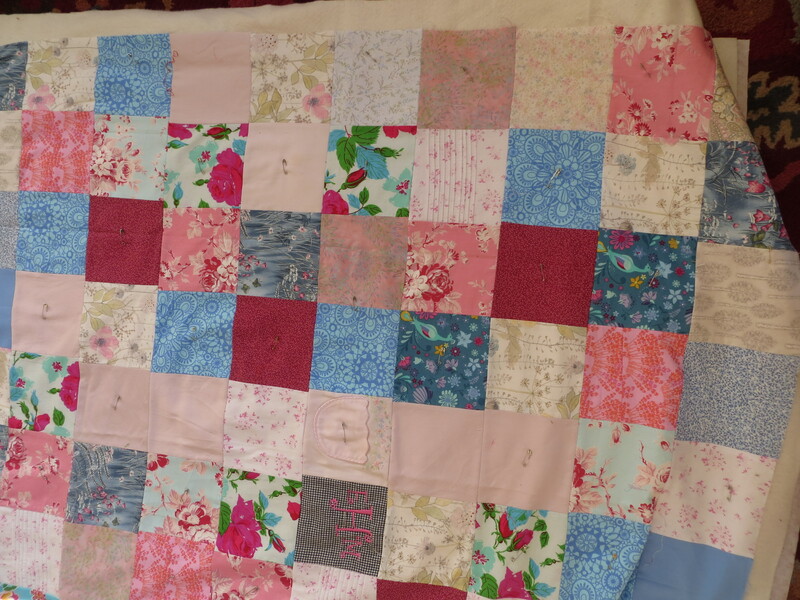 This year (2014) I have nearly finished my first quilt and have gotten serious about another one! For years, I have saved scraps of fabric from clothes that I have made my children. I have also save some of their clothes, despite the stains or tears, because I loved them, or I loved the memories of my children in them. I had a hazy vision of using the scraps of fabric and cloth to make something for my children. But every attempt at piecing together right angles of fabric had been an acute failure (math pun intended). This past Christmas, my mother gave me a rotary cutter and mat, making angles, straight sides, and correct measurements much easier. 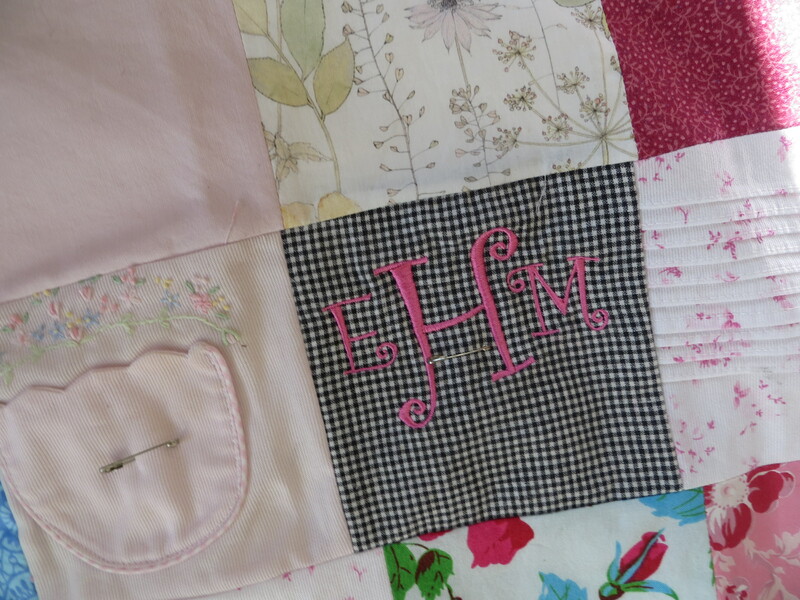 I decided to try to make a quilt for Evva (because my scraps were leaning to pink and blue and I think of those colors and Evva together). I have used scraps from clothes I’ve made for her, dresses she grew out of (and were stained–one had a monogram I cut out), and a few left overs from other projects. I used a very simple pattern–just squares sewed together–for this first knot quilt (from Stitched in Time by Alicia Paulson–book I found at the library). This has been a fun project, and I have plans to make a quilt for Anne now, too. 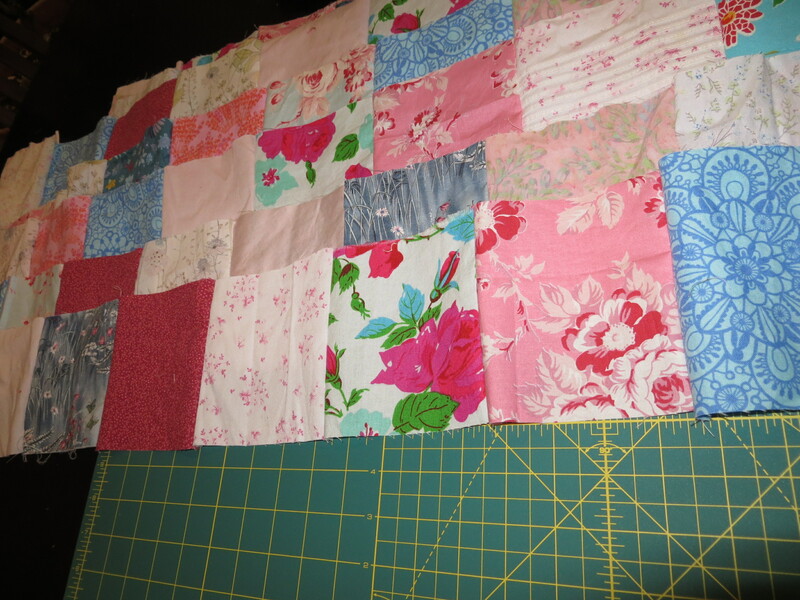 Maybe the same piecing, but adding quilting stitches instead of knots. The other quilt I have gotten serious about does not involve piecing, but does involve a lot of tradition. More about it on another day.